Prepackaged backpacking food is often blah and expensive. If you’ve thought “I could do better than this”, start with this book, Trail Cooking: Trail Food Made Gourmet. 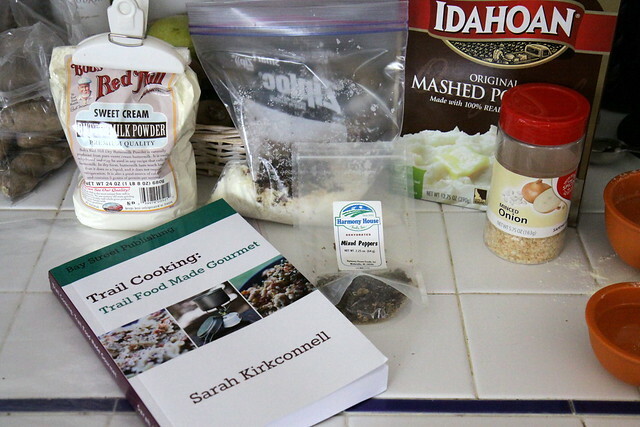 This is the brand-new cookbook from Sarah Kirkconnell, who writes at trailcooking.com. The meals I’ve made from this book and it’s predecessor, Freezer Bag Cooking, are easy to make, cost half as much as pre-made backpacking meals, and are bigger portions, that is, enough food. I made “Cheese Steak Mashers” (page 171) for a weekend backpack that was forecast to be wet and cold (it was). Here is the ready-to-pack meal (the bag in the center) along with the ingredients. The recipe calls for beef jerky to be simmered for a while, but I substituted a small can of chicken, which was easier and tasty. If you think you can’t find some of the ingredients, check out Sarah’s guide to the less-common ingredients. I highly recommend this style of backpacking meals and Sarah’s cookbook. Give it a try, and have some tasty days on the trail.